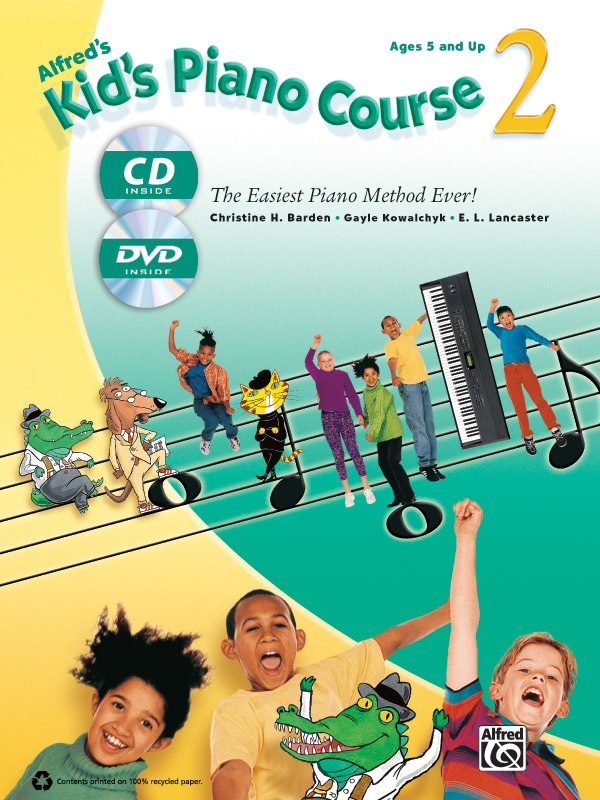 * Alfred's Kid's Piano Course is the easiest piano method ever for kids ages 5 and up. * Using plain language that's easy for kids to understand, three irresistible piano experts guide students along---a clever classical dog, one cool jazz cat, and a friendly alligator who loves the blues---they focus attention by pointing out what's important on each page and make learning music fun! * Book 2 picks up where book 1 left off. * Kids will learn to play more notes and melodies, read additional music, and perform lots of fun songs. * This book also includes an accompanying MP3 CD so you always know how the music should sound. * The disc includes beautiful recordings of all the music in the book and can be downloaded to your iPod® or other mp3 player. * The DVD includes every lesson and example explained and played by expert teacher Gayle Kowalchyk. * Ideal for home schooling.